Amazon offers the CyberPower CP1500AVR 900W Intelligent Battery Backup UPS System for $94.95 shipped. Also at B&H. For a price comparison, this unit usually sells for around $140. 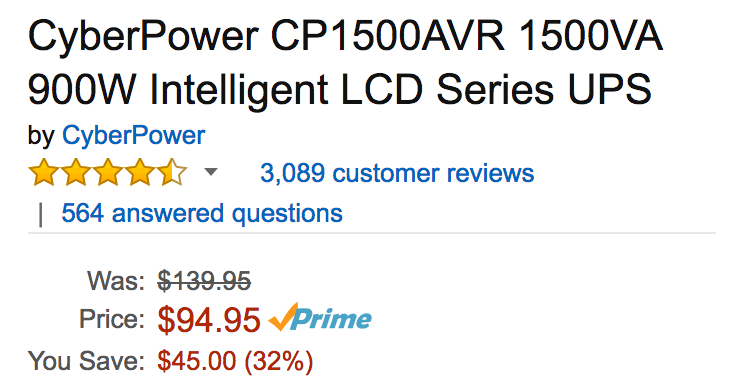 Today’s deal is a match of the Amazon all-time low price. Protect your valuable electronics and gear during power outages/surges with this CyberPower UPS system. It has twelve surge-protected outlets in total, six of which have access to the internal battery. At 900W, you’ll have enough time to safely power down your Mac or home theater before any damage is done. This is an Amazon favorite, with over 3,000 reviewers leaving a 4.5/5 star rating. A mini-tower UPS with line interactive topology, the CyberPower Intelligent LCD CP1500AVRLCD provides battery backup (using simulated sine wave output) and surge protection for desktop computers, workstations, networking devices, and home entertainment systems. The CP1500AVRLCD uses Automatic Voltage Regulation (AVR) to correct minor power fluctuations without switching to battery power, which extends battery life. AVR is essential in areas where power fluctuations occur frequently. When power goes out for even a second it can result in data loss and hardware damage which can shorten equipment life expectancy. This battery backup unit provides sufficient emergency runtime power to allow for safe closure of open files and proper shut down of electronics when an outage occurs. In addition, it safeguards electronics from commonly occurring power surges caused by storms, activity on the power grid, or high-powered equipment turning on and off.